Build-up or “blinding” on vibrating screens is a maintenance nightmare. It causes a decrease in productivity and adds to unnecessary downtime. 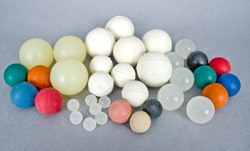 To alleviate this unwanted headache we offer screen cleaning balls in a variety of high quality compounds to suit your specific application requirements. We have included a chemical resistance chart to assist you in choosing the compound that best fits your needs. 5/8", 7/8", 1", 1-1/8", 1-3/8", 1-5/8" & 2"
Polyurethane – food grade Extremely chemical and abrasion resistant. Has tremendous wear life. Optimum rebound / maximum cleaning action. White natural – food grade Natural rubber has excellent abrasion resistance and tear strength. Black EPDM - Good weather, ozone and abrasion resistance. Wide temperature range. Pink Buna-N / Nitrile Comparable to neoprene, but offers slightly better abrasion resistance. Translucent silicone – food grade Silicone does well in applications with higher temperatures. It is resistant to oxidation & ozone.